Where does CEO Dennis Quaintance get all the custom furnishings in his company’s O.Henry and Proximity hotels or his Lucky 32 Southern Kitchen, Green Valley Grill or Print Works Bistro dining establishments? Not from a wholesaler or vendor. 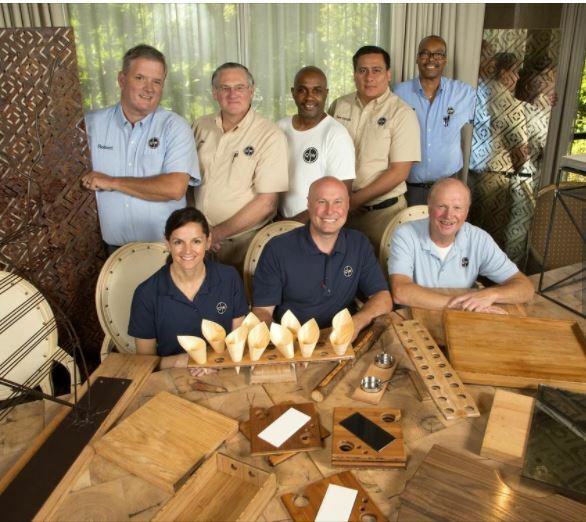 From chairs, tables, cabinets and mirrors to lampshades, coat hooks and painting screws, Greensboro-based Quaintance-Weaver’s in-house craft guild designs and produces the unique furnishings and specialty items that help set the luxury hotels and upscale restaurants apart. But here’s the kicker: Not only are the furnishings custom-made; often, they’re significantly less expensive to make than they would be to buy from someone else. As an example, Quaintance pointed to refinished countertops at Proximity done by the craft guild that would have cost “three times more” if done outside the company. Founded after Promixity opened late in 2007, the guild produces most of the furnishings and decorative items for the company’s hotels and restaurants out of a workshop on East Lindsay Street. Holton’s charcoal-on-canvas sketches — they will soon be colored — adorn the walls in each room at Proximity. Quaintance said he believes the well-traveled executives who frequent his Greensboro hotels notice the unique designs and detailed craftsmanship. Quaintance estimates the guild has done 100 projects at Proximity, the first facility in the hospitality industry to receive LEED Platinum status from the U.S. Green Building Council for its energy efficiency and high performance. “They come back and they like to see the changes,” Kennedy said. Guild members produce items conceived at design meetings held most Tuesday afternoons at different sites. In recent weeks, Proximity has received the most attention. Those projects at the industrial-chic hotel include “antiqued” mirrors and several dozen side tables with gold leaf frames and enameled concrete tops. Guild projects also fill the O.Henry as well as QW restaurants. Lobbies, guest rooms, dining rooms and outdoor terraces are filled with utilitarian and decorative items created or refurbished by the guild to fit into nooks and crannies and complement the design. Finding those perfect items were often a problem prior to the formation of the craft guild. During the recession that began in 2007, Quaintance said he moved Kennedy, hired as an engineer at O.Henry, to a position working for all of QW’s businesses. Kennedy gradually assembled a versatile staff, capable of doing not only general maintenance duties, but creating top-quality products. “I asked Jeff, ‘Why can’t we start building things instead of buying them?’” Quaintance recalled. Majedeh Modarres Nezhad is the design team project manager. Quaintance, who admits design is one of his passions, attends most of the meetings but said everyone’s opinions are considered equally. Prior to forming the craft guild, Quaintance said he and the late Don Reeves, his former designer, came up with ideas, then hired vendors to carry them out. How much has QW saved by forming the craft guild? Quaintance said he doesn’t know. John Brasier covers development, commercial and residential real estate, construction and retail.